The V28 Cordless Woodcutting Circular Saw is the industry's most powerful cordless saw ever produced. 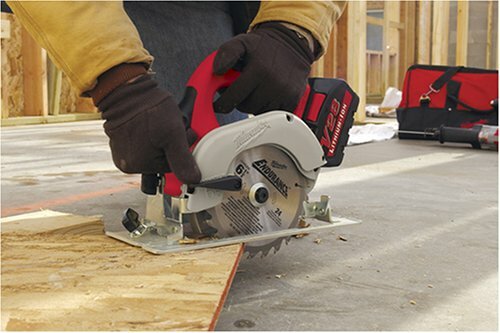 This revolutionary saw has the most power of any cordless saw on the market. Nothing can top the performance of this tool in terms of speed of cutting or overall run time. In addition, this saw comes standard with tactile grips for even more control while cutting. The lightweight magnesium guards reduce unnecessary weight without compromising operation. The high strength aircraft aluminum shoe resists bending for accuracy and dependability. 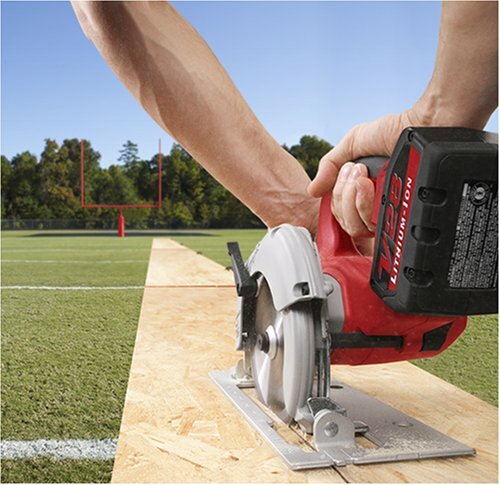 Why waste time with extension cords and generators when the V28 Cordless Circular Saw is ready to go right now. No more downtime with cut cords or cords to trip on while working in precarious locations. The V28 provides the power of a corded tool with none of the added problems. 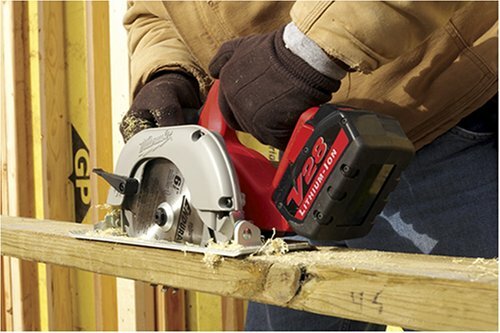 The V28 Circular Saw is only one of the many new V28 products now available from Milwaukee Electric Tool Corp. 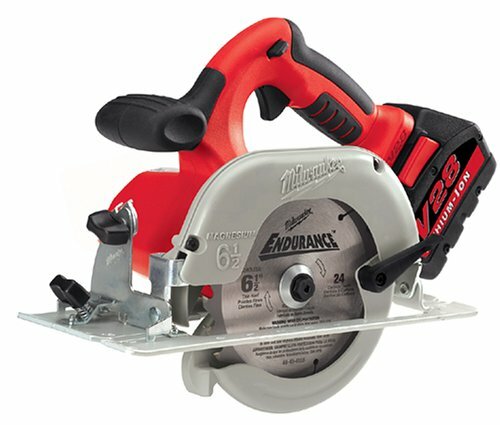 I have milwaukee's 18v version for two years and then this saw for about 7 months, it is the best cordless circ saw on the market right now, for both power and endurance. BUT: it is not a replacement for a corded saw as milwaukee advertises, it will do on 1 battery what the 18v's do on 2. IT's fit and finish are very good and the tool is about the same weight as the 18v. this is a good buy. This is an excellent outside job saw. The weight is perfectly balanced for me, allowing easy cutting in tight spaces or on the portable workbench. The stock blade is fine for general outdoor jobs. In the woodshop, it makes short work of 3/4" plywood. This is the perfect example of why it's so important to check Amazon daily: At $263 including shipping (the saw, the charger and two batteries) plus a free mail-in tool body certificate (I selected the hammer drill) how can you go wrong? 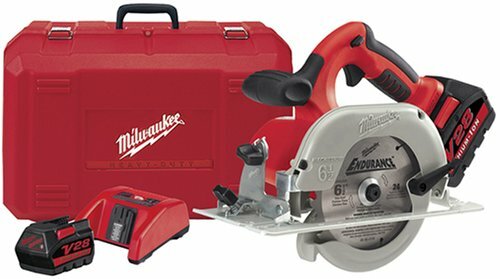 Two 28v LiOn Milwaukee tools w/ charger and 2 batteries for $263!?!?!? How can Home Depot compete with that? This was my 5th circular saw, but the first cordless model. I'd wanted one for a long time, but before this tool, none had enough run-time. - Not even close to the power of my old corded (13 amp) Makita Hypoid circular saw, or 30-year old (10 amp) Craftsman circular saw; but it's still the most powerful cordless model available. Hardly anything slows those larger saws down, but that can and does happen with this V28 saw. - The thin kerf blade bends much easier than a standard blade on a corded saw. As a result, it doesn't always work well with a saw guide. This is because the blade can get off-track to one side or the other and isn't sufficiently stiff to straighten itself. In other words, you're pushing the saw forward, but the blade may have wandered off to one side, messing up the cut. Cutting freehand against a drawn line works well, however. - Excellent design and build quality. - 28 volt Lithium-Ion batteries; the highest voltage and longest lasting batteries; latest battery technology. Of the three primary tool battery technologies, NiMH or Lithium-Ion batteries are clearly the best, and NiCad is clearly inferior. - V28 power. Good power and run-time for a cordless circular saw. Circular saws used on big cuts drain batteries, so to use one all day on a construction job, you'll need multiple recharges. I still use a corded saw for the most demanding cuts, or angle cuts in thicker wood, but for everything else, this one does fine. - Press a button on a V28 battery and 1 to 4 LEDs will shine, indicating remaining power. You'll know if it needs a charge BEFORE climbing the ladder, etc. - Excellent ergonomics; comfortable grip at the correct angle for good control, good switch function, good cutting-depth and angle-setting knobs, and a good safety switch (to not turn it on by mistake). - Perfectly balanced, lighter and smaller than 7" corded saws. Aircraft aluminum sole-plate and magnesium blade guard. 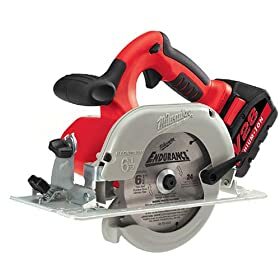 - Being right-handed, circular saws like this one with the blade on the left, are best, since I don't have to lean over the tool to see the pencil line when cutting. - Comes with an excellent thin-kerf carbide tipped blade that's good for most things. Blade is razor sharp, and cuts through plywood, OSB, and 2x lumber with ease. Replacement blades are available at most tool-sale locations, and everywhere on the web, since they use a standard 5/8" arbor. Panasonic's cordless circular saw, by comparison, uses a blade with an unusually sized arbor (20mm -- 21/32"), which is not widely available and expensive when you can find one. - Release the switch and the electric brake stops the blade almost instantly. - Tool has much less torque than a corded saw, so there's much less chance it will twist out of your hand while cutting. In that regard, it's safer. I frequently use it with one hand only. - It sure is nice to have no electric cord hassles. I take it to Home Depot type stores, and cut materials, when needed, so they'll fit in my SUV; something you can't do with a corded saw. - Tool is guaranteed for 5 years, parts and labor. (Register online at Milwaukee dot com.) Batteries are guaranteed for 2 years at full replacement, and prorated for 3 more years. I have to agree with Fine Woodworking's 2008 Tool Guide, which calls Milwaukee's cordless line-up, "the best tools for serious work". My advice is to consider buying this circular saw as part of the Milwaukee 0928-29 V28 Cordless 4-Tool Combo Kit. For $200 more, you also get the V28 Sawzall, the V28 hammer/drill, and the V28 flashlight, which is a much better deal than just buying this saw. All are excellent and designed for day-in day-out contractor use. - Not even close to the power of my corded Makita Hypoid circular saw; but it's still the most powerful cordless model currently available. Hardly anything slows the Hypoid down, but that can and does happen with this V28 saw. The V28 saw blade also binds much easier. I had purchased Milwaukee's V28 circular saw ten months ago. Like all the other V28 products I've bought, this one certainly is an outstanding product. However, don't expect it to be a replacement for your corded one. The power is quite impressive, but if you run though something a bit too thick, the saw does seem to bog down a little. It also uses quite a lot of juice because the batteries don't last as long as they do in other V28 products. It wouldn't be practical if you needed to use it constantly, since you'd need a lot of backup batteries. In addition, due to its 6-1/2" blade, bevel cuts are only good for thin wood. It's small, light weight, and very easy to handle. I currently use it for quick cuts where I don't want to haul out a cord, or don't have enough cord to reach remote areas. Twice we had a power failure at the jobsite, where this saw turned out to be an absolute life saver. It that role, it's the perfect saw. Now, I can't imagine not having it with me when I show up for work. I got this saw as part of the milwaukee kit and have had it for about 3 months now. On the current site most of the work involved cutting sheet material and 2by4 cross cutting. For this work the saw is ideal. It is light and easy to work with. A good indication is that my workmates, who didn't like my v28 drill, love this saw. Very soon all other saws went back in the box and the milwaukee became the team saw. All of them agree this the best cordless tool around. It has had lots of usage, used constantly every single day. I have put it back in the box now because the blade is totally blunt and I don't want to burn it out. Put this saw through the paces today, free hand cutting exterior .451 inch tongue and groove plywood for a 12' gable end on a roof. This is my first cordless saw and I should have gotten one of these two years ago. By waiting though, I bought the latest battery technology with the Milwaukee V28 Lithium-Ion, which puts the older battery types to shame. I love the freedom from a cord, and the brake on this saw stops the blade immediately when you off trigger the power. Free hand cutting this thin plywood was a good test of the saws ability to stay on the line and not make wandering cuts. I used 2x4 extension supports on my saw horses to hold up the plywood sheet and during one cut I didn't position the ply away from the 2x4 underneath, and as the blade encountered the support lumber, the saw bogged down a little (I actually thought the blade was just getting pinched) and then it emerged past the 2x4 as I finished my cut. The 2x4 was cut like I had used my miter saw, perfectly clean. And this cut was at quite an angle, like 60 degrees, so I was cutting through the 2x4 for quite aways. Very impressive. I then used the tool to trim off the thinner outer edge of the plywood. I normally would have used my jig saw for this, but the Milwaukee saw offers such confident control, I marveled at the way it shaved off this thinner stock and just kissed the fatter edge of the ply with the backside of the blade as I used it to smooth it off flush. Using this saw will turn you into a plywood surgeon. After I was done, I recharged the battery, even though the battery wasn't showing signs of being drained, which took about 20 minutes. Its good to know though, that the second battery provided with the saw was ready to go if I needed to go to it, so I could keep cutting. One thing you'll want to have when you use this saw is ear protection. The thin kerf blade makes a racket. Use the plugs. Update: One con (and my only complaint) is the way the depth of cut adjusts. Its hard to put a progressive tension on the adjustment; its either too tight to move the shoe up or down, or it just free falls to the end stop. I may have to take it apart and add a lock washer or something on the bolt to allow a smoother operation. More later.